I greet you all in the name of God who calls, informs and transforms us. Amen. If I was to say, like young Samuel, that I am hearing voices, you would all say, "Archbishop, you need to see a psychiatrist or psychologist." But I want to assert to you that God still speaks to us today. Thank you, Mr West and your staff as well as Professor Watson, the Chairperson of Council, for the invitation to preside at the licensing of Sue as Chaplain to this prestigious school. Thank you very much Mr West for the kind words of welcome, more importantly for inviting us and the school to pause and reflect as well as to pray for the soul of Nelson Mandela. Let me also start by congratulating the school and you all for your 2013 matric pass rate. I have never been so proud to be associated with Herschel and to be a parent at the school – you have been named as number one in the Western Cape for matric passes in 2013. It is indeed a "wow" moment, and I am going to ask you to pause and applaud this great achievement. I am sure that Madiba, who was your neighbour in Bishopscourt after retirement as President, is smiling down at you for this achievement, for he believed, and I paraphrase him, that education is the key to advancement and human flourishing. Now turning to you, Sue, as this is your special occasion and I want to give you padkos, that is food for your journey. 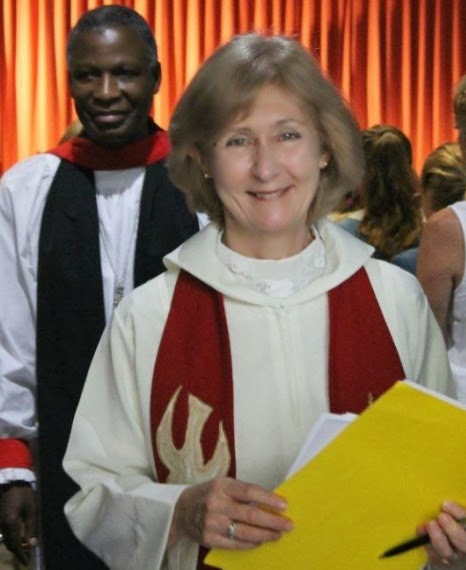 You firstly join this diocese, the Diocese of Cape Town, as a priest in the church of God and then as Chaplain of this prestigious Anglican school. Congratulations on your appointment and thanks to those who interviewed and selected you for this role. I know that as a priest and teacher you will serve the school well. You join a team of hard-working girls, industrious and able staff members, and a visionary and practical head of school and council members. Sue, your task is both challenging and a great joy. You have what I call a double quandary, that of being Samuel, the servant, who says, "Speak Lord, I am listening," but at the same time, being Eli, who is called to help the girls and the school to discern the voice of God in our midst and in our time. Like Eli, you are to give the girls and staff, as well as parents, the confidence to listen and to hear God’s voice, but equally help us to find and exercise our own voice. In the midst of competing volleys of dogmatic utterances, you are called to create space, especially for the girls and this place to discern all that is Godly and noble and truthful. You are to help the school, which may drown in a sea of privilege, to discern the word of God, yearning and crying in a sea of poverty where many South African youngsters are learning in mud schools and may possibly be destined for failure and hopelessness. This discernment has to lead to action. Sue, welcome to this place and I pray that you will grab that voice, that very thin yet mysterious thread and weave into the tapestry of what is called Herschel, the spiritual dimension. In other words, I pray that you will grab God by the scruff of the neck, take God and bring God here, and then take the school by the scruff of its neck to where God needs it to be, in such a time as ours, in the world. As an Anglican priest in the church of God, a church whose declared Vision is to be Anchored in the love of Christ, Committed to God’s Mission, and Transformed by the Holy Spirit, you are to help the girls, and indeed the whole Herschel community, to be anchored in all that is loving and caring, to be committed to the pursuit of Godly knowledge in the world and to be critical in doing so, and to be transformed by God’s love and voice in God’s world. With this brief homily and comments, welcome Sue, as we license you as Chaplain to the school.